This morning I got an email from Transport for London letting me know about an upcoming Tube strike. This isn’t the first time it’s happened. 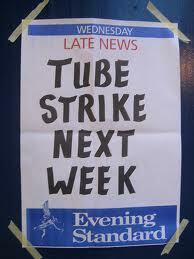 It seems like the RMT and TSSA unions call a strike about once a month. Each time I get an email about it. I admit I’ve never been part of a union and don’t claim to be an expert on striking, but I always thought the purpose of a strike is to refuse to work until you get something you want (usually a pay raise). It seems like the idea is to strike without notice so that the business can’t function and the employer has no choice but to concede just so you go back to work and the business can go on making money. But for the RMT it’s almost like a strike is a built in holiday. Why else would you do it on a monthly basis? And to give enough warning that they can send an email about it and operate extra buses and boats? It’s baffling. I’m still trying to figure out how not showing up for work proves that your job is worth not cutting. (Apparently that’s what they’re striking over, the potential cut of ticket office jobs). The funny thing is, this is the second time the strike has fallen on a day I intend to go shopping. Going shopping is one of the few reasons I need to ride the Tube. And they had to pick Monday. Happy Christmas to you too, RMT.